A poet, who has lost his mother and brother, and also wife and child, goes to sit at his desk. His writing alter ego lives in the desert of the big city and is looking for a travel companion. (I saw a man. He has no name. Give him all our first names in one. He is the son of a woman and a father. he goes into town. He passes by my window. Dusk falls, he passes by again. The Song of the Foolish Bees is from New Poems and marks a clear break for Nijhoff from his earlier views on poetry. In the 1930s, Adriaan Roland Holst was still regarded as the “great poet”, the “poeta vates”, yearning for an otherworldly “other country”. In comparison to him, Nijhoff considered himself to be a “poeta minor”, a poet who lacked wings. 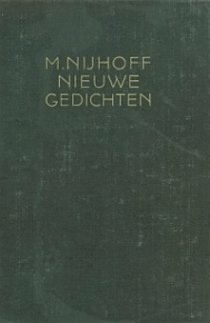 But in New Poems, a collection published during the world economic crisis that led to Hitler’s rise to power in Germany, Nijhoff demonstrated a new, self-aware and modernist style. Far from thoughts of the upper or other worlds, he focused on earthly reality. His sonnet The Mother the Woman starts with the most prosaic lines in all of Dutch poetry, about the poet going to see a bridge. The poem does end with a vision, about his mother singing psalms. Some poets have a street named after them when they die. Nijhoff got a bridge. Naturally, it is located in (Zalt)Bommel.